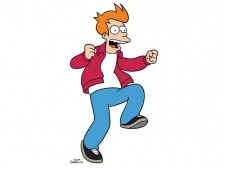 Fry's name is the most used name in titles of episodes and comics of Futurama (not counting titles of film episodes). The names in titles, including the names of characters, are sometimes used more than once. The following is a list of these names and the titles in which the most frequent of them appear. Clicking a link followed by an arrow/square icon (such as this one) will lead to a search of article titles (main namespace) containing either one of the least frequent of the names or a repeating non-noun. You can also search for occurrences of these here and here. "Leela & Amy in Hostile Makeover"
The titles of comics #33, #34, and #35 all contain the name of a character. This page was last edited on 2 September 2015, at 21:53.